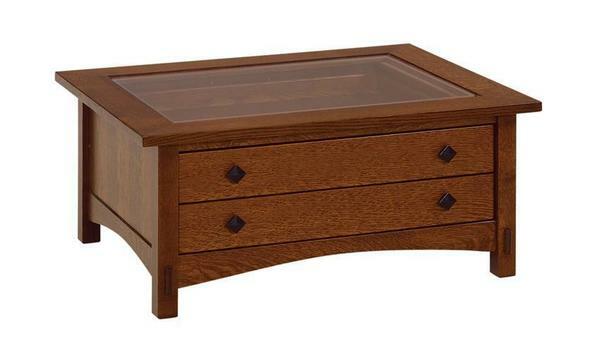 Our beautiful Amish Lucern Vitrine Table is the perfect place to showcase your collectibles. This Vitrine Table is skillfully made by Old Order Amish craftsmen who share the rich heritage of woodworking. The collectibles are protect inside the vitrine table and viewed inside the beveled tempered glass inset top. There are also two drawers for additional storage space. The two coffee table drawers come on full extension drawer slides that are side mounted. The exposed tenons on the legs creates a rustic Mission looking coffee table. This Amish Coffee Table is Amish handcrafted in customer's choice of Oak Wood, Brown Maple Wood, Rustic Cherry Wood, Quarter White Oak Wood and Cherry Wood. We also offer a wide variety of stains and paints for customers to choose from. I would recommend this product to anyone who is looking for well made custom furniture. American made.